According to a new report North America Automotive Telematics Market (2018-2024), the North America Autmotive Telematics market is expected to attain a market size of $60.5 billion by 2024, growing at a CAGR of 20.9% during the forecast period. Advance diagnostic system is a feature that would boost the telematics market. In advanced diagnostics, an inbuilt mechanism relays real-time messages to the driver and the automobile dealer in case of any issues that are likely to affect the vehicle, which will help predict potential automobile issues before they take place. Insurance sector is one of the important drivers for telematics market, particularly in aftermarket solutions. For instance in North America, nearly every vehicle insurance company is either using or plans to use some sort of telematics solution, as it enables the insurance companies to minimize risk through monitoring of different aspects such as maintenance, usage & security etc. In 2017, US dominated the North America Telematics Market by Country with market revenue of $12,639.4 Million. However, Mexico would exhibit maximum CAGR of 25.9% during the forecast period (2018-2024). 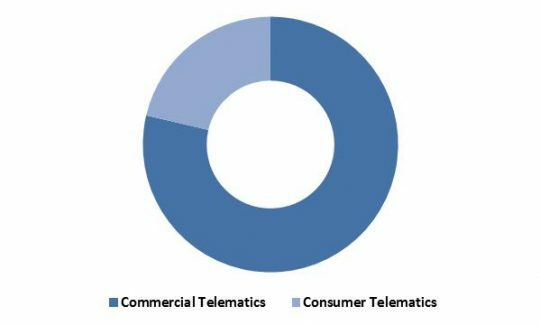 In 2017, Aftermarket segment dominated the North America Commercial Telematics Market By Mode of Deployment with market revenue of $6,971.6 Million. This segment would grow with a CAGR of 14.7% during the forecast period (2018-2024). In 2017, Fleet / Asset Management dominated the North America Commercial Telematics Solution Market By Type, and would garner market revenue of $10,132.3 Million by 2024. However, Others segment would exhibit maximum CAGR of 35.0% during the forecast period (2018-2024). In 2017, Insurance segment dominated the North America Consumer Telematics Market (2018-2024) By End User, and would garner market revenue of $6,757.3 Million by 2024. However, Government Agencies would exhibit maximum CAGR of 37.1% during the forecast period (2018-2024). The report has exhaustive quantitative insights providing a clear picture of the market potential in various segments across the countries in North America. The key influencing factors of the North America Automotive Telematics market have been discussed in the report along with the elaborated company profiles namely Verizon Communications Inc., AT&T Inc., Ford Motor Company, BMW AG Robert Bosch GmbH, Valeo S.A, Harman International Industries, Incorporated, Vodafone Group Plc and TELEFNICA, S.A.